I'm assuming many of the recent visits to the site have come through PC World's "50 Greatest Gadgets" article. First of all...welcome. Second of all, you'll notice I haven't updated this page in over two years. Much as I love my SX-70, I haven't shot with it much lately for a simple reason: Time-Zero film is even harder to come by than ever. Walgreens used to be my fall-back (and at $15/pack, it's not a great place to have to fall back on) but even they don't carry the film anymore. There's still eBay but again: do not buy expired film. It's not the picture quality, it's the emulsion leaking out that you have to be wary of. By the way, I discovered something interesting lately, talking to another SX-70 enthusiast...the reason for the "Endless Summer" effect on my Polaroids from July '04 was not related to the film: instead, my friend speculated that I have a small pinhole in the camera that is allowing extra light in and that's what creates those crazy, washed out colors. Cool effect though I might have to buy a better SX-70 in order to take "proper" pictures down the road (but first, I need more film). Also, it's worth noting that prices on the SX-70 have seemingly risen considerably in the last few years. They were always collector's items but I think there's been an increasing awareness of them and demand is driving up prices. A note: a lot of what's sold on eBay says "untested" and I'd really, really caution people from buying those. At one point, I ran through THREE different SX- 70s that I got (all from eBay) and they were all broken, even the ones that seemed like they were in pristine mechanical condition. The only way you can be sure it works is if the seller tests the camera. Especially given the age of many of these, there is any number of problems you can potentially run into that you'd never be able to diagnose without actually testing the camera. Not to cast suspicions, but a seller who lists their camera as untested is either being lazy or trying to pass off a busted camera. If any of you have SX-70 appreciation pages with photos, please email me: I'd love to see some more. email me at c2h5oh@yahoo.com for information on polaroid film that I can not share on line. Keep up the good work, hope you find a source for film soon! 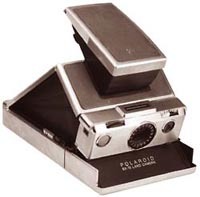 I hate to tell you this but "Polaroid will be discontinuing the manufacture of its SX-70 / Time-Zero film within the first 3 months of 2006 due to the phasing out of components used in the production of this film."